Ralph spent 17 years in corporate life, the last 10 of which he managed the training and management development of managers and business owners in a three-state area. He left the corporation in 1983 and for the next 8 years, he and Connie were the owner-operators of two restaurants with about 100 employees. During this time, Ralph was deeply involved in church, having served in many capacities among which were deacon and deacon chair, finance and budget director, director of Christian education, teacher, youth director, church camp counselor and director and VBS director. After selling the restaurants in 1991, Ralph surrendered to full time Gospel ministry in 1992. He began his ministerial studies through Boyce Bible College. Ralph spent over twenty years pastoring churches in the Dayton, Ohio area until moving to Colorado in late 2013. He was called to his current position in January of 2015. Ralph’s focus in the churches is INTENTIONALITY: to bring people in, raise people up, and send people out equipped to share Gospel of Christ. He and Connie love exploring the beauty of the mountains, watching Ohio State football and spending time with their family. Ralph will tell you that only by pursuing God and his plans for your life INTENTIONALLY will we grow His Kingdom. John was born and raised in Helena, Montana. He grew up in a broken marriage, not a broken home. John grew up not in church but on a lake where he enjoyed building forts, mini-towns on the hill behind their cabin, boating, swimming, water skiing and fishing when he could catch fish. His dad married twice and so he is the youngest of four boys in the first family and has a sister and brother from the second. Though all of his parents are deceased, they still speak volumes into him. John likes to invite people to Jesus before inviting them to church because after He was found by Christ and believed in Him, church made sense. He loved connecting with people and then seeing them grow deeper in relationship with Jesus. He was the most surprised person when God called Him into the ministry at age 19. He has been married to his gracious wife, Rhonda, since 1983 and they have three children, two daughters and a son. He enjoys caramel on or in about anything, watching quality movies like "The Three Amigos," hiking with a friend or family member, cycling, running (because he still can), and golfing (when he can afford it). John has been in ministry for over 30 years in Arkansas, Texas, Virginia, and Colorado. He has held a variety of ministry positions including pastor to children, youth, discipleship, education, and administration. He has also served as the lead pastor of two churches. He has been a part of leading two church plants and now coaches/mentors nearly a dozen church planters. John recently earned a doctorate in Leadership from Golden Gate Baptist Theological Seminary. His doctoral project focused on the crucial role core values play in churches and ministry organizations. The end game for John is for people to see Jesus and the church as the same entity and for people to call both home. Oscar De La Cruz, Sr. is originally from Mexico and comes from a traditional Mexican family of four sisters and three brothers. He studied Psychology of Human Relations in the Autonomous University in Mexico. He lived much of his life between Juarez and El Paso, Texas where he worked in a record shop where it was his responsibility to acquire all the latest American releases in the music scene. That is where he met his adorable wife Aurora De la Cruz. In 1983 he and Aurora decided to move to the United States and got married in May of 1984. They have two sons, Oscar, Jr. and Oliver as well a beautiful daughter-in-law Candi and two precious granddaughters, Sofia and Sonja. In 1994 Oscar had a personal encounter with God at Open Door Baptist Church that changed his life in a radical way. It was there that Oscar demonstrated his eagerness to be involved in ministry in any way possible by having a servant’s heart. Oscar set up chairs for the service and picked up hymnals afterwards, doing whatever was needed like picking up the trash and cleaning bathrooms. Oscar was so grateful for what Jesus had done for him that he just wanted to express his gratitude. Oscar also served as a Sunday school teacher and a singing evangelist during this time period. Oscar has had the opportunity to share the gospel with many people over the years and has seen many come the feet of Christ through his ministry endeavors. 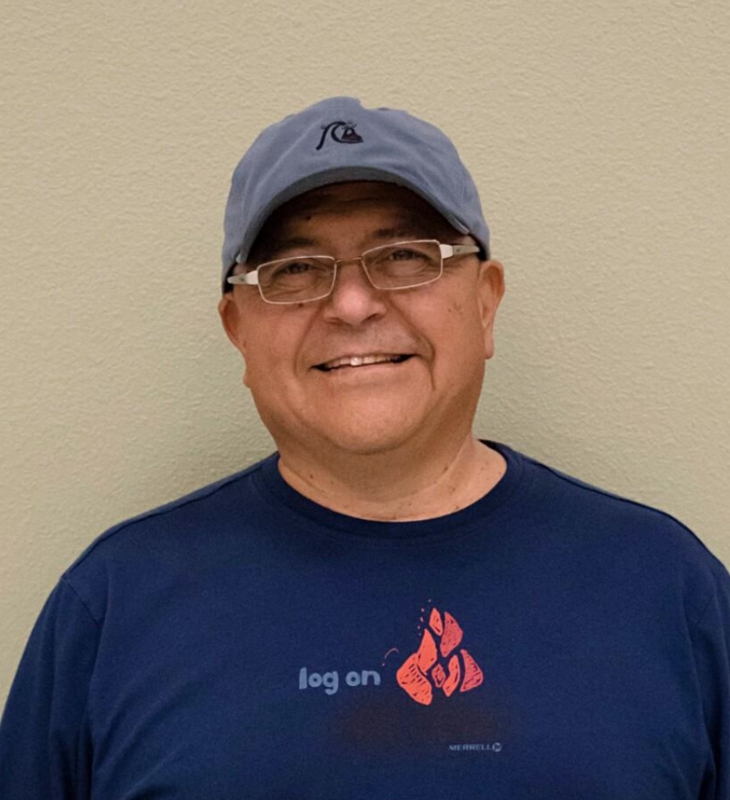 In his role as the Hispanic Coordinator for LPBA, he arranges trainings for new church planters, pastors, and lay leaders for Hispanic ministries and he serves as a church planter as well. He also worked as a church planter specialist with NAMB in 2011. Oscar has planted six Hispanic churches in various areas of Colorado, learning a lot from all of those church plant experiences that have led him to mature in his work. His wife Aurora works alongside with him in all of these ministries. Oscar earned his certificate in associates in theology from Advantage College in Sacramento California in 2004 and was ordained as a pastor in 2008. He feels a burden from God to preach the gospel to as many Hispanics as he can and see them come to Christ and find their hope and identity in Him in these difficult times for Hispanics. Nancy Mann and her husband Kelly are originally from Georgia. They met in college as athletes who shared a two-sport coach at (then) Georgia College in Milledgeville. Nancy has a dual BBA in Business Information Systems and Management and worked in the computer industry in the late 80s-early 90s. When Kelly joined the United States Army after completing vet school at the University of Georgia, Nancy became a volunteer and full-time mom to their two children Carter and Casey. Kelly has now retired from his Army career and is working for Mantel Technologies in Fort Collins. Nancy was blessed to re-enter the work force with the LPBA and is thoroughly enjoying the opportunity to serve in this capacity. The Longs Peak Baptist Association supports church leaders, strengthens existing churches, and starts new churches in northern Colorado.